Click the Change Subject Area button . The Model Contents area on the left lists the contents of the cube you selected. You can expand folders and drag and drop items into the Pivot Builder area. The Pivot Builder area in the upper right provides options that you use to create pivot tables. This area consists of the Rows, Columns, Measures, and Filters boxes. The Pivot Preview area in the bottom right displays the pivot table in almost the same way that it will be shown in dashboards. The Model Contents area lists the contents of the cube that you are currently viewing. For this tutorial, select Dimensions from the drop-down list; this option displays the measures and dimensions in the given cube. Click the triangle next to any dimension name to expand it. A dimension contains at least one level and may also include a special member known as the All member. In the following example, the AgeD dimension includes an All member named All Patients, as well as the levels Age Group, Age Bucket, and Age. In this section, you create a simple pivot table that uses levels and measures in a typical way. The goal of this section is to see how levels and measures work and to learn what a member is. The numbers you see will be different from what is shown here. Expand the DiagD dimension in the Model Contents pane. Drag and drop Diagnoses to Rows. Drag and drop Patient Count to Measures. Drag and drop Avg Age to Measures. The system displays a dialog box where you specify the pivot table name. 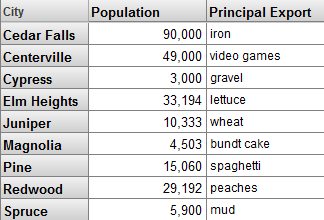 Save the pivot table and give it a name. When you do so, you are saving the underlying query that retrieves the data, along with the information needed to display it the way you chose. You are not saving the data. The base table is Patients, which means that all measures summarize data about patients. Apart from the header row, each row of this pivot table displays data for one member of the Diagnoses dimension. Therefore, each row in this pivot table displays data for a set of patients with a particular diagnosis. Other layouts are possible (as shown later in this book), but in all cases, any data cell in a pivot table is associated with a set of records in the fact table. In a typical pivot table, each data cell displays the aggregate value for a measure, aggregated across all records used by that data cell. To understand the contents of a given data cell, use the information given by the corresponding labels. For example, consider the cell in the asthma row, in the Patient Count column. This cell displays the total number of patients who have asthma. 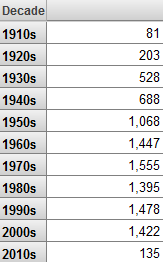 Similarly, consider the Avg Age column for this row. This cell displays the average age of patients who have asthma. For different measures, the aggregation can be performed in different ways. For Patient Count, DeepSee sums the numbers. For Avg Age, DeepSee averages the numbers. Other aggregations are possible. In this section, we take a closer look at measures and levels. Drag and drop Count and Avg Age, to the Measures area. This simple pivot table shows us the aggregate value for each of these measures, across all the records in the base class. There are 10000 patients and their average age (in this example) is 35.93 years. In a separate browser tab or window, access the Management Portal and go to the SAMPLES namespace, as described earlier. Expand GenD on the left. Click the query you ran previously. Click the X button in the Rows pane. This action clears the row definition. Drag and drop Electrician to Rows. In many scenarios, you can use dimensions and levels interchangeably. In this section, we compare them and see the differences. In the Analyzer, click New. The measure shown is Count, which is a count of patients. In this case, we see the same results except for the caption above the rows. In the Patients sample, the names of dimensions are short and end with D, and the name of a level is never identical to the name of the dimension that contains it. This naming convention is not required, and you can use the same name for a level and for the dimension that contains it. AgeD defines a special member called All Patients, which is an All member. An All member refers to all records of the base class. AgeD defines multiple levels: Age Group, Age Bucket, and Age. When you drag and drop a dimension for use as rows (or columns), the system displays the All member for that dimension, if any, followed by all the members of the first level defined in that dimension. In this case, the first level is Age Group. An All member refers to all records of the base class. Each dimension can have an All member, but in the Patients cube, only one dimension has an All member. Drag and drop Age Group to Rows. In the Row Options area, click the Summary check box, leave Sum selected in the drop-down list, and then click OK. The Total value is appropriate for Patient Count but not for the other measures. For Avg Age and Avg Test Score, it would be more appropriate to display an average value rather than a sum. Click the Pivot Options button again. In the Row Options area, clear the Summary check box and then click OK. The All Patients row is a more useful summary line than the Total line. 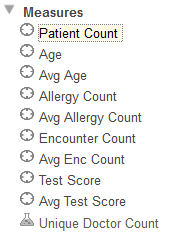 It shows the Patient Count, Avg Age, and Avg Test Score measures, each aggregated across all patients. 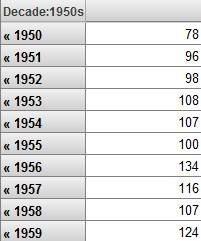 For Avg Age and Avg Test Score, in some cases, you might prefer to have an average of the values shown in the pivot table. For example, for Avg Age, this summary line adds the ages of all patients and then divides by 10000. You might prefer to add the values of Avg Age for the three members shown here and then divide that by three. The All member does not help you do this; instead you would create a calculated member (discussed later in this tutorial). Drag and drop Diagnoses to the Rows pane. As you can see, you can use the generically named All Patient member with dimensions other than Age, the dimension in which it happens to be defined. A dimension contains one or more hierarchies, each of which can contain multiple levels. The Model Contents area lists the levels in the order specified by the hierarchy, but (to save space) does not display the hierarchy names for this cube. Users can take advantage of hierarchies to drill to lower levels. This part of the tutorial demonstrates how this works. Expand the BirthD dimension in the Model Contents pane. Drag and drop Decade to Rows. Double-click the 1950s row (or any other row with a comparatively large number of patients). Click anywhere to the right of the << symbols. This double-click behavior is available within pivot tables displayed on dashboards (not just within the Analyzer). Click the << symbols repeatedly to return to the original state of the pivot table. A level can have properties, which you can display in pivot tables. Expand the HomeD dimension in the Model Contents pane. Drag and drop City to Rows. Drag and drop Population to Columns. Drag and drop Principal Export to Columns. Click the X button in the Rows pane. Drag and drop ZIP to Rows. These properties do not have values for this level. Properties can have string values. Properties have values only for the level in which they are defined. Depending on how a cube is defined, properties can also affect the sorting and the member names of the level to which they belong. There are examples later in this tutorial. This part of the tutorial demonstrates listings, which display selected records from the lowest-level data for the selected cell or cells. 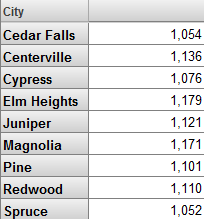 To see how these work, we will first create a pivot table that uses a very small number of records. Then when we display the listing, we will be able to compare it easily to the aggregate value of the cell from which we started. Drag and drop Patient Count and Avg Test Score to Measures. Expand the AgeD dimension in the Model Contents pane. Drag and drop the member 0 to Columns. This member refers to all patients who are less than 1 year old. Note that you must click the member name rather than the icon to its left. Drag and drop the member 1 to Columns, below the member 0. Drag and drop the Birth Time level to Rows. Click a cell. For example, click the Patient Count cell in the 12am row, below 0. Count the number of rows displayed. This equals the Patient Count value in the row you started from. Click the Display Table button to redisplay the pivot table in its original state. By default, the Patients cube uses a listing called Patient details, which includes the fields PatientID, Age, Gender, and others, as you just saw. You can display other listings as well. Click the Pivot Options button to display options for this pivot table. For the Listing drop-down list, click Doctor details and then click OK. The Doctor details listing displays information about the primary care physicians for the selected patients. Click the same cell that you clicked earlier and then click the Display Listing button . In a typical pivot table, you use members as rows, as columns, or both, as seen earlier in this chapter. Another common use for members is to enable you to filter the data. Expand ColorD and Favorite Color. Drag and drop Favorite Color to Rows. 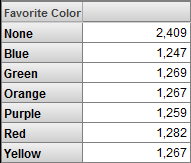 This pivot table displays the members of the Favorite Color as rows. The measure shown is Count, which is a count of patients. Drag and drop Red to Filters. Make a note of the total number of patients. 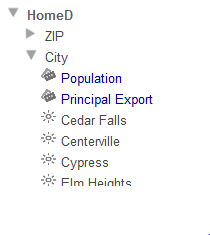 Click the X button in the Rows box. The Total line displays the sum of the numbers in the column. Notice that the total here is the same as shown earlier. You can use any member as a filter for any pivot table, no matter what the pivot table uses for rows (or for columns). In all cases, the system retrieves only the records associated with the given member. You can use multiple members as filters, and you can combine filters. For details, see Using the DeepSee Analyzer. In DeepSee, you can define searchable measures. With such a measure, you can apply a filter that considers the values at the level of the source record itself. Click the Advanced Options button in the Filters box. Click Age Group, which enables you to edit this part of the expression. Click the = operator, which enables you to edit this part of the expression. Click 0, which enables you to edit this part of the expression. Type 10 into the field and click Apply. Now let us see the effect of adding a level to the pivot table.